Recently the Fix Freeze Feast, 2nd Edition cookbook by Kati Neville and Lindsay Ahrens, arrived at my home unannounced. I am a wanna-be freezer cooker so this arrival excited and enticed me. My current reasons for not being a freezer cook is lack of space in my kitchen for large scale prep and the fact that I am usually only cooking for 2-3 people. The concept behind Fix Freeze Feast is simple: buy ingredients in bulk and make delicious meals to freeze and store for busy days. Each recipe makes enough food to feed a family of four for 3 nights (or more), so cooks maximize their efforts on prep days. Main dishes like Asparagus and Potato Frittata, Tuscan Meatloaf, and Pecan-Crusted Chicken Strips join soups, sides, sauces, and snacks, plus breakfast classics like granola and burritos. 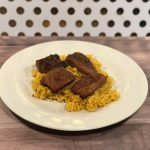 Instead of costly takeout or commercially prepared freezer meals, families can enjoy the global flavors of Sweet Asian Chicken, Spanish Rice, and Caribbean Pork Tenderloin with little fuss. The second edition of Fix Freeze Feat features more than a dozen new recipes, including some that are plant-based and globally inspired, as well as revisions to previous recipes. Updated for the way people cook today, these meals are lighter and fresher than traditional bulk-cooking recipes, with a focus on simple stir-fries, quick grilled main courses, and vegetable-packed sides. There are several recipes in this book I cannot wait to try. 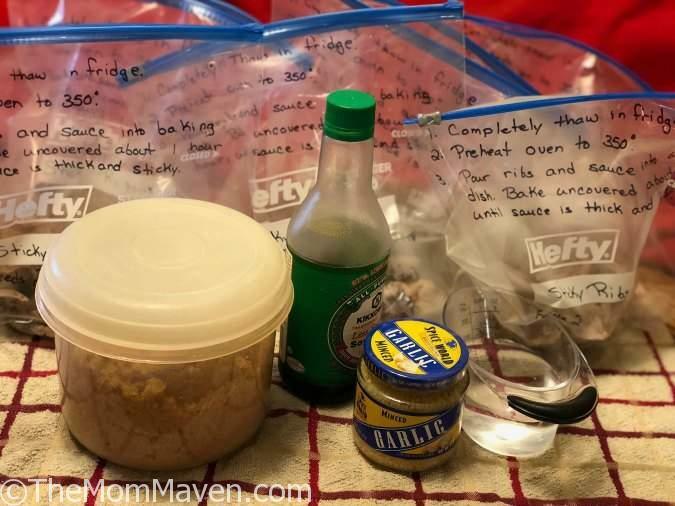 I hoping once Jordan and Savannah get married next month and settle in, that Savannah and I can get together occasionally and prepare some of these freezer meals to have them handy for the busy days. I want to try the Breakfast Burritos, Classic Red Sauce, Asian Market Marinade, Garlic Mashed Potatoes, Tex-Mex Chicken Fingers, Chicken Parmigiana and more. Since this recipe makes 3 large meals I had to do some math so that I could turn these 18 servings into 9 meals of 2 servings each. I plan to share these with Jordan and Savannah so that they will have some food in their freezer when they return from their honeymoon. Keep reading to get to the recipe card. This recipe starts with 9 pounds of boneless country-style ribs. Thankfully Detweiller’s Farm Market had them on sale for $1.89 a pound in the long strips. The first thing I did was cut the strips into 4 pieces so they would be more manageable. Place the ribs in a large stockpot and cover with water. Simmer ribs until tender, about 1 hour. 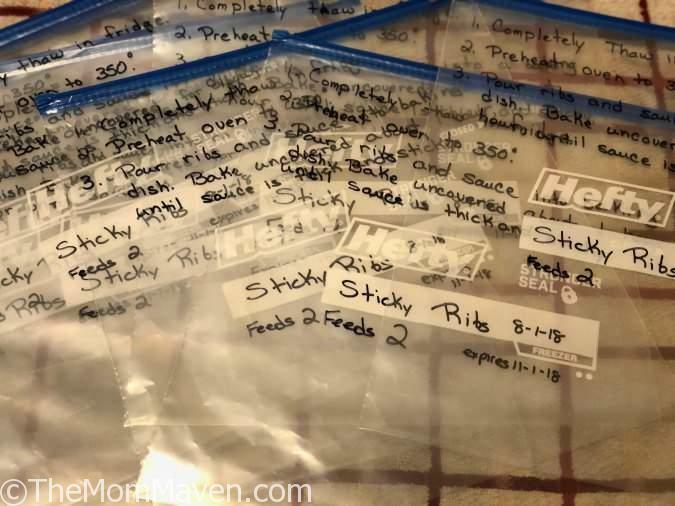 While the ribs are cooking grab your 1-gallon freezer bags and a sharpie marker and label the bag with the recipe name, date packaged, expiration date, and how to prepare. When the ribs are tender, drain and divide the ribs evenly among the prepared bags. Into each bag, measure 3/4 cup brown sugar, 1 cup water, 1/4 cup soy sauce, and 1 tablespoon minced garlic. Seal and gently shake each bag to combine contents. Freeze. Food will stay optimal quality for up to 3 months in freezer. To cook one meal completely thaw one bag in the refrigerator. Preheat oven to 350°. pour ribs and sauce into an ungreased baking dish. Bake, uncovered for about 1 hour, or until sauce is thick and sticky. As you can tell from my picture, my sauce never really got thick, I’m guessing my math was off a bit. That didn’t matter though because we drizzled the sauce over the rice and ribs and it was delicious! Make sure you grab your copy of this cookbook here. 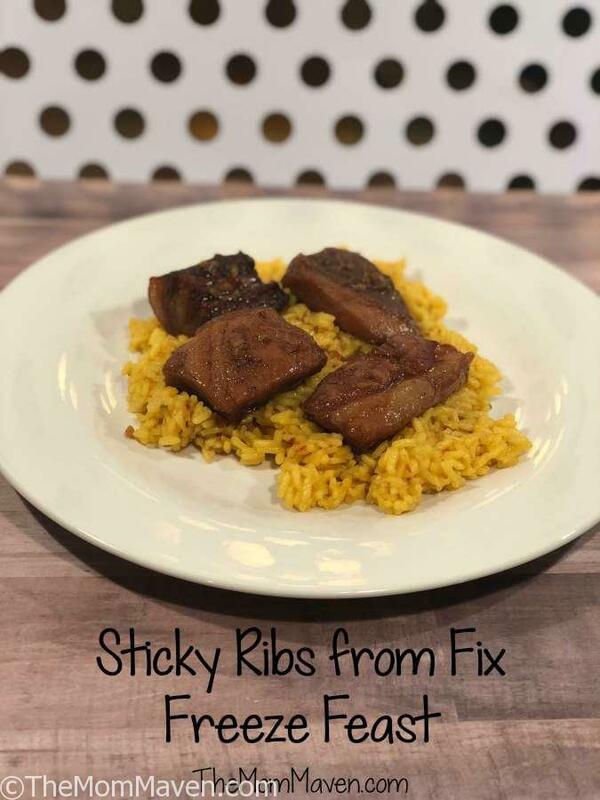 An easy recipe from the Fix Freeze Feast Cookbook. This recipe makes 3 meals of 6 servings each. Place the ribs in a large stockpot and cover with water. Simmer ribs until tender, about 1 hour. Drain and divide ribs evenly among freezer bags. Into each bag, measure 3/4 cup brown sugar, 1 cup water, 1/4 cup soy sauce, and 1 tablespoon garlic. Seal and gently shake each bag to combine contents. Food will stay at optimal quality for up to 3 months. Completely thaw 1 freezer meal in refrigerator. Pour ribs and sauce into an ungreased baking dish. Bake, uncovered, for about 1 hour or until sauce is thick and sticky. 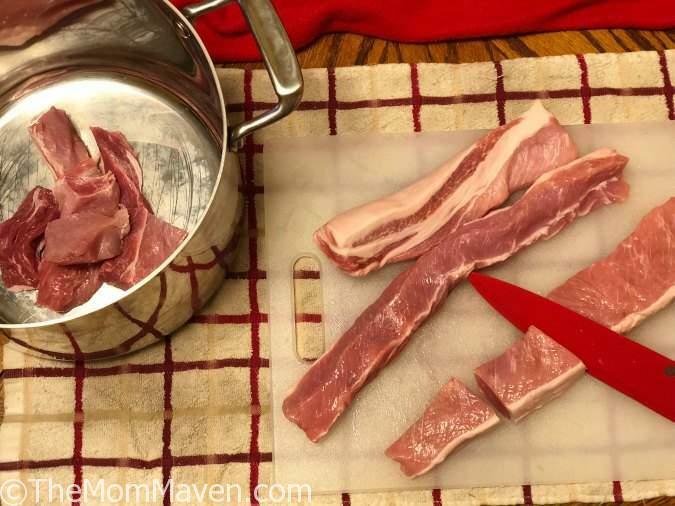 I ribs are in long strips, I recommend cutting them into smaller pieces. 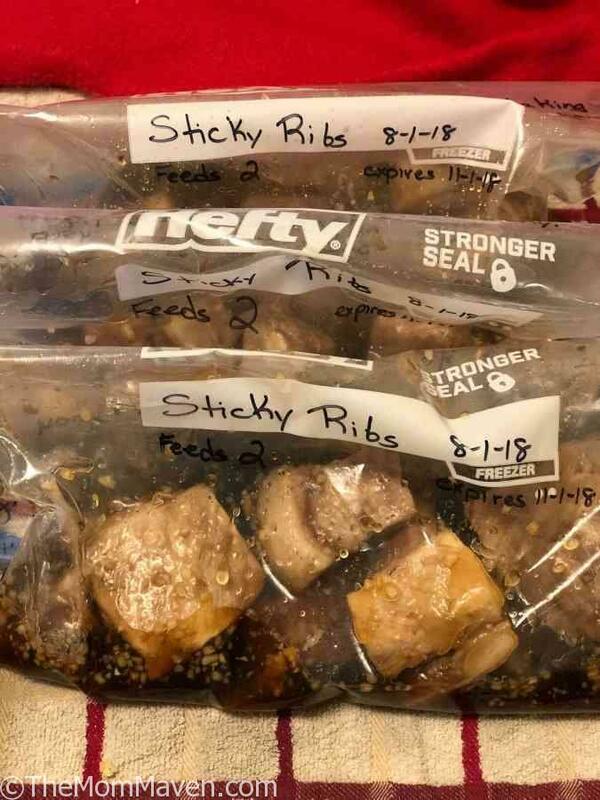 While ribs are simmering, label the bags with the date frozen, expiration date, name of recipe, and how to prepare the meal.